CROSSFUEL KETO PROTEIN is a nutritious and balanced supplement with 70% of calories from clean fat, 20% of calories from protein and low net carbs, resulting in a delicious protein shake that supports a ketogenic lifestyle. You can use Crossfuel Keto Protein as a substitute for a snack or a meal replacement to help you feel fuller and support your ketogenic lifestyle. 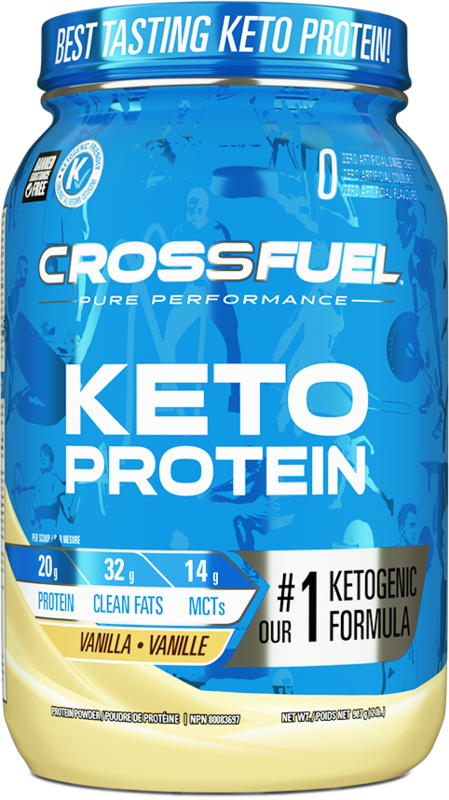 Crossfuel Keto Protein uses a blend of protein sources (whey protein isolate, milk protein isolate and micellar casein) to provide you with essential amino acids involved in muscle protein synthesis resulting in the maintenance of good health. CROSSFUEL Keto MCT Oil is packed with Medium-Chain Triglycerides (MCTs) which acts like a ketogenic booster. We strive to deliver a clean fat content to our consumers through the premium fat sources designed for ketosis. Crossfuel Keto MCT Oil contains only clean fat from Coconut Oil with 2,275 mg of MCTs. 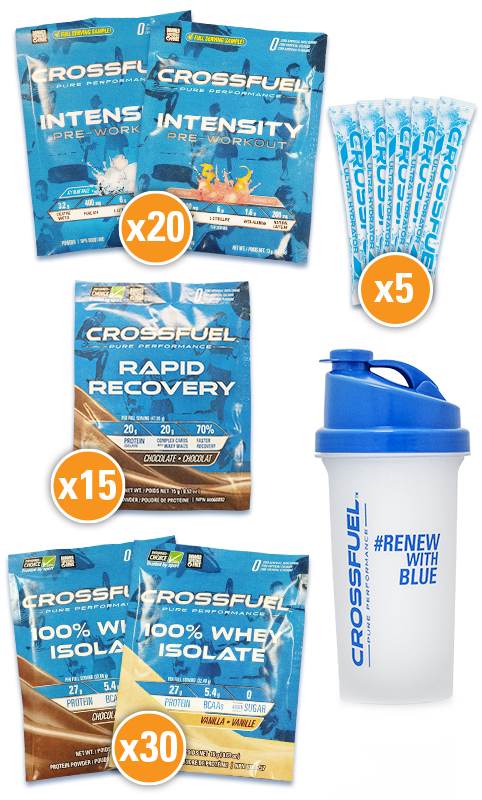 This sample pack is a great way to try the various Crossfuel products without having to purchase a large quantity. Try each one today and determine your favorite. CROSSFUEL 100% WHEY ISOLATE is one of the cleanest and purest sources of protein available today and rapidly absorbed into the system. 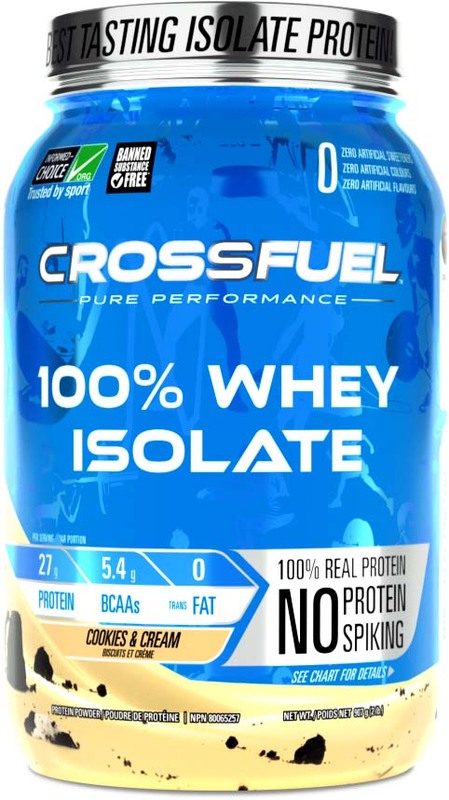 CROSSFUEL 100% WHEY ISOLATE offers pure whey protein isolate with high levels of the important amino acids BCAAs and L-Glutamine to aid in muscle recovery and repair. With 27 g of protein per serving and less than 1% of carbs and fat, CROSSFUEL WHEY ISOLATE is perfect for those looking to build a lean physique. 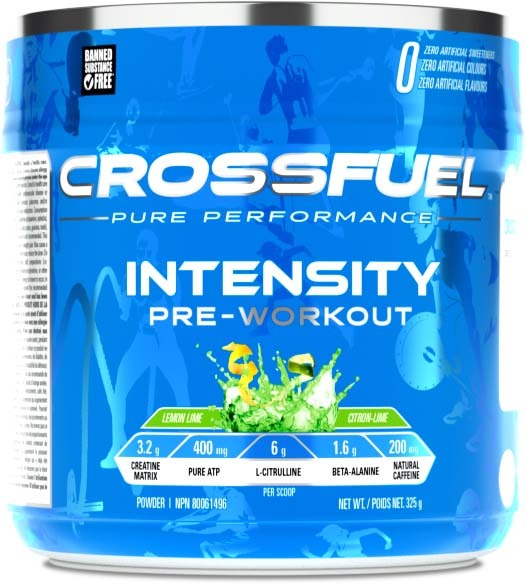 CROSSFUEL WHEY ISOLATE is “Instantized” to allow for easy mixability. 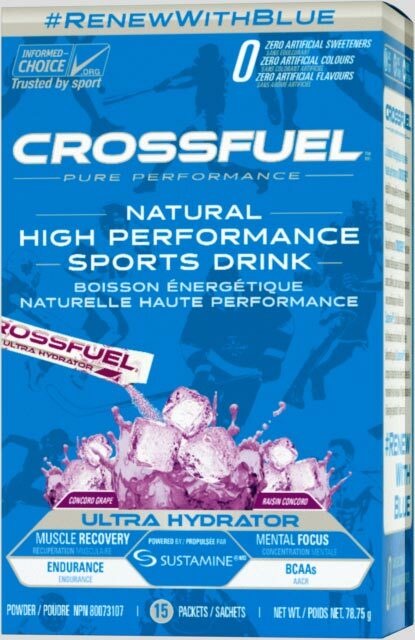 All CROSSFUEL supplements are made with zero artificial colours, flavours or sweeteners. 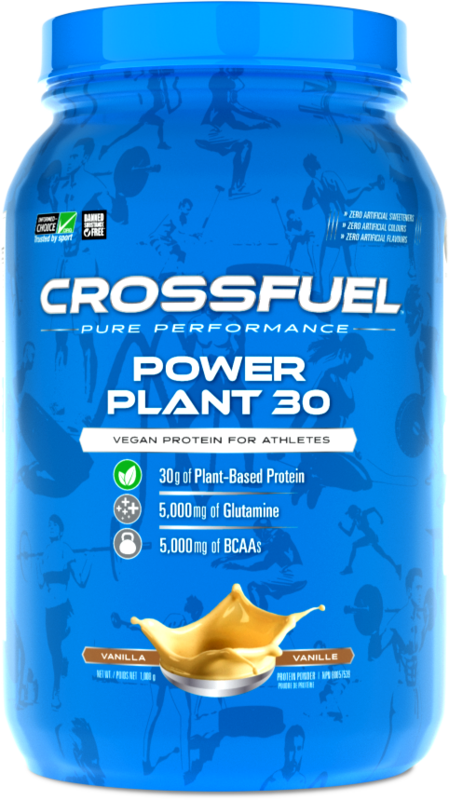 CROSSFUEL POWER PLANT 30 is a powerhouse of vegan proteins developed to work synergistically together to help repair, fuel and reduce recovery time to working muscles. POWER PLANT 30 is loaded with an industry leading 30 grams of quality protein per scoop from Pea, Rice and Hemp and is rich in Glutamine and Branched Chain Amino Acids. Now Vegans don’t have to sacrifice with low protein doses and ineffective formulas to feed the demands of high intensity fitness. 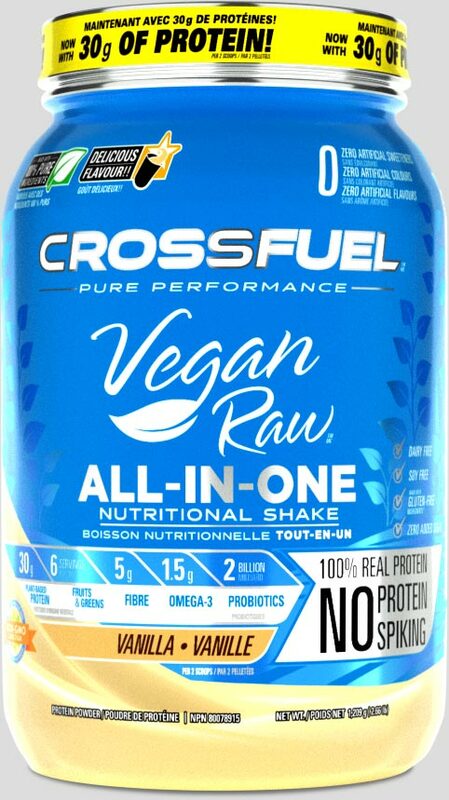 CROSSFUEL VEGAN RAW ALL-IN-ONE Nutritional Shake is a Plant Based Protein Blend including Fruits & Greens, Fiber, Omega-3 and Probiotics. As the leader in plant based performance protein, VEGAN RAW has set a new standard of quality and effectiveness by providing the most premium Vegan Protein option for high performing athletes. VEGAN RAW contains zero artificial sweeteners or colours and an industry leading formulation containing clinical doses of plant based ingredients. 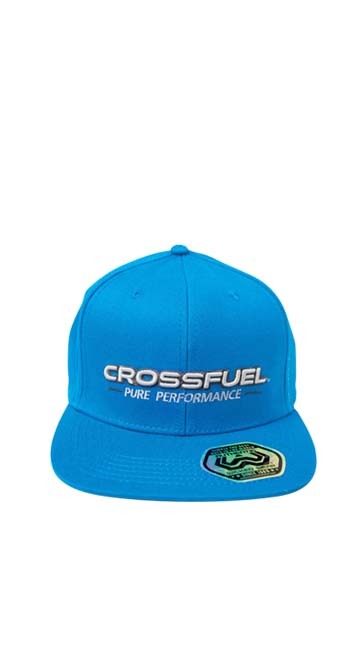 We are able to set ourselves apart from our competitors and provide our products to high performing professional athletes who choose CROSSFUEL VEGAN RAW as their preferred protein source. 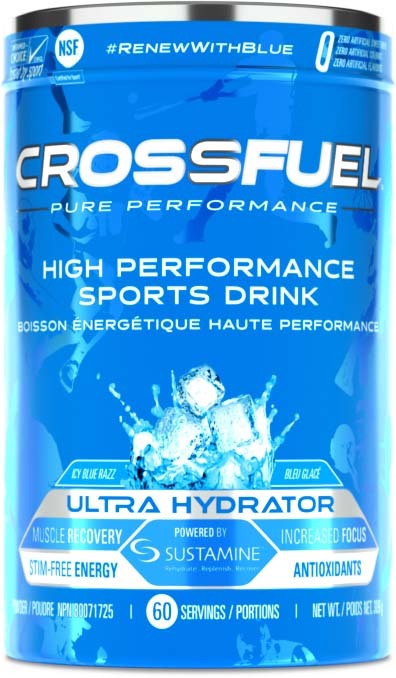 CROSSFUEL INTENSITY is a completely unique formula designed for unsurpassed muscle performance, endurance and energy with a feeling of euphoria. The potent combination of L-Citrulline, Beta-Alanine, Creatine HCL & PURE ATP makes Intensity a powerhouse of athletic energy, fueling a simply amazing workout. INTENSITY is powered by organic caffeine from Green Coffee Bean and antioxidants from Olive leaf. 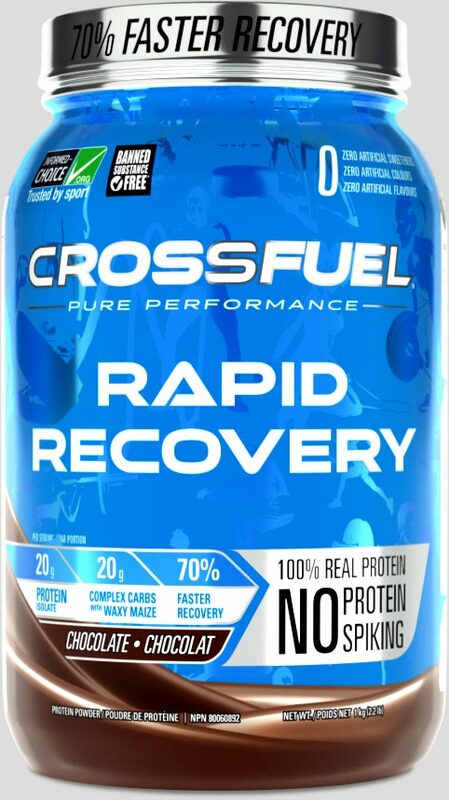 CROSSFUEL RAPID RECOVERY. Recover in hours not days! RAPID RECOVERY sets a new standard in muscle glycogen replenishment, repair and protein synthesis containing a 1:1 ratio of fast acting isolate protein with high Insulin reacting complex carbs. The anabolic window is the key to supporting muscle growth. This 30 minute period, immediately post exercise, is when your body is primed for muscle growth and repair, if given the proper nutrients. Containing new Cherry Pure, Tart Cherry extract, RAPID RECOVERY contains vital compounds, critical for muscle growth while reducing inflammation, muscle soreness increasing recovery. * Percent Daily Values based on a 2,000 calorie diet. 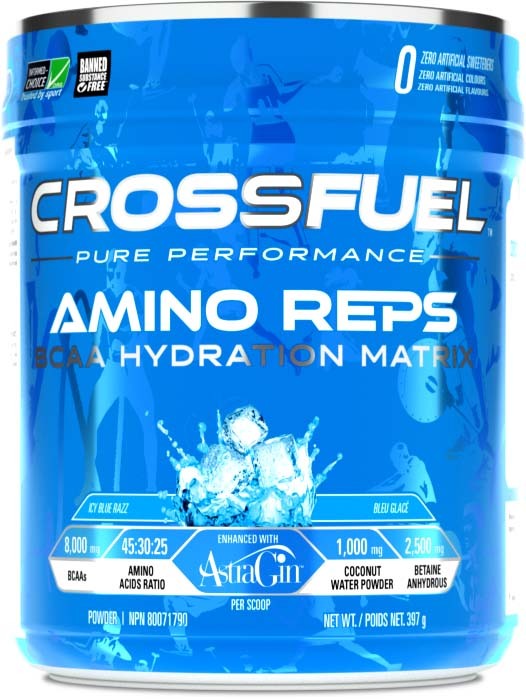 CROSSFUEL AMINO REPS is a revolutionary, new, high performance amino acid and hydration powder designed to push performance and recovery to the next level. With a clinically validated BCAA ratio of 45:35:20 enhanced with Astragin, AMINO REPS is ultra-refreshing and can be taken any time you drink water on training days. The addition of Crystalized Coconut Water and Betaine provides working muscles vital electrolytes and helps lower the effects of Cortisol. 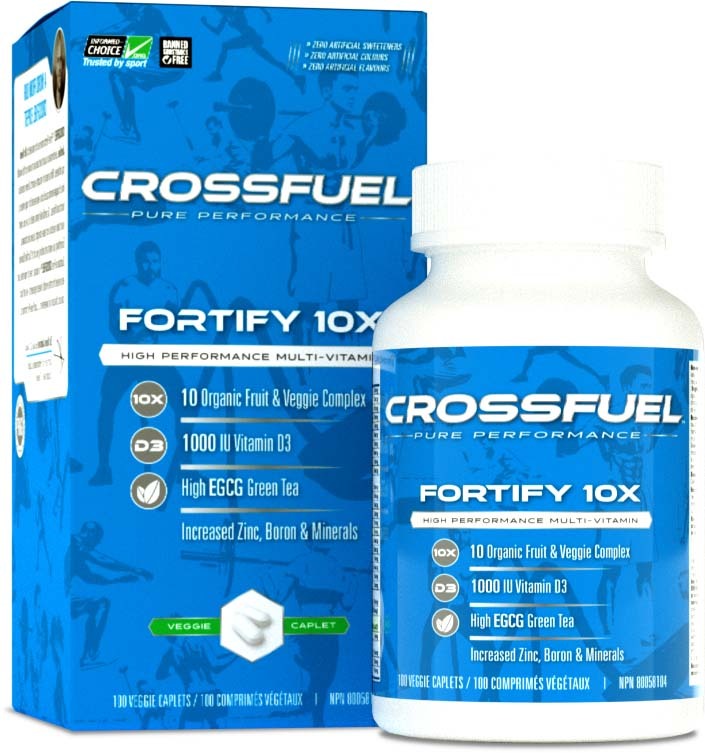 CROSSFUEL FORTIFY 10X is a full spectrum Multi-Vitamin that provides a potent anti-oxidant blend of 10 Organic Fruits and Vegetables per serving. High levels of Boron, Zinc and an elevated 1000 mg of Vitamin D3 contribute to hormonal support and the immune system. FORTIFY 10X also is a source of key antioxidants from high ECGC organic green tea all delivered in all natural vegetable caps. CROSSFUEL Joint Care is a natural joint care formula. CROSSFUEL Joint Care contains premium natural ingredients that support healthy joints. Joints are the body’s hinges. They provide a wide range of motion throughout the body, allowing us to swing, bend, rotate and more. Each joint is made up of cartilage, ligaments and a lubricating fluid called synovial fluid which all work together to cushion the area between bones and support comfortable movement. Without healthy joints, bones can rub together and make even the simplest movements painful, which is why properly caring for joints is so important. ** Percent Daily Values based on a 2,000 calorie diet. 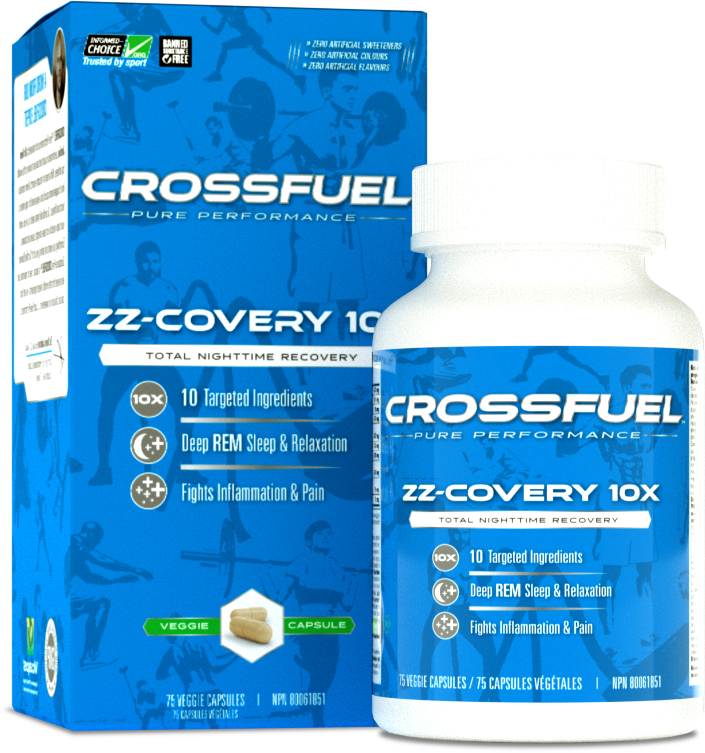 CROSSFUEL ZZ-COVERY 10X combines ten powerful ingredients that specifically help that body reach a deep level of sleep while addressing inflammation and repair. Sleep plays a major role in athletic performance. The quality and amount of sleep athletes get is often the key to getting results. REM sleep in particular provides energy to both the brain and body. If sleep is cut short, the body doesn’t have time to properly repair and release vital hormones. CROSSFUEL CoQ10 is a powerful antioxidant that plays a key role in energy generation, aids in the maintenance of good health and helps to support cardiovascular health. CROSSFUEL Red Krill Oil is formulated using sustainably sourced omega-3 oils. CROSSFUEL Red Krill Oil offers naturally-pure red krill oil with 2.6x better absorption than regular fish oil. CROSSFUEL Red Krill Oil has been shown to support cardiovascular health. 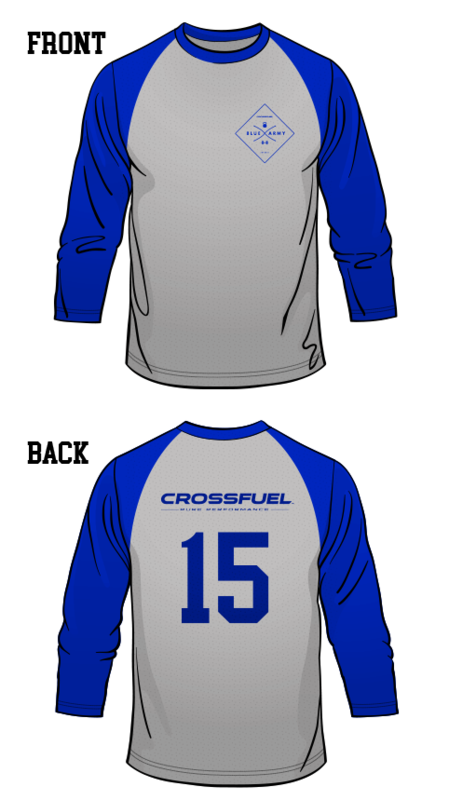 You know that Crossfuel knows how to do a baseball tee, because you’ve probably got a few of them. And that’s why we’re so confident that you’re going to love the newest one, the Crossfuel Hand Crafted BLUE ARMY Baseball Tee. This is one of our best items to dress up or down with. It really does do it all. The BLUE and Grey combo stands out without being loud, while the logo on the front lets everyone know that sweat, passion, and strength are the bottom line. We finished it off with a small stacked logo on the back of the neck so that whether you’re coming or going, people know it’s a hand crafted CROSSFUEL original. Made from heavy duty, High-density BPA-Free Plastic with a leak-proof flip cap, and removeable strainer. 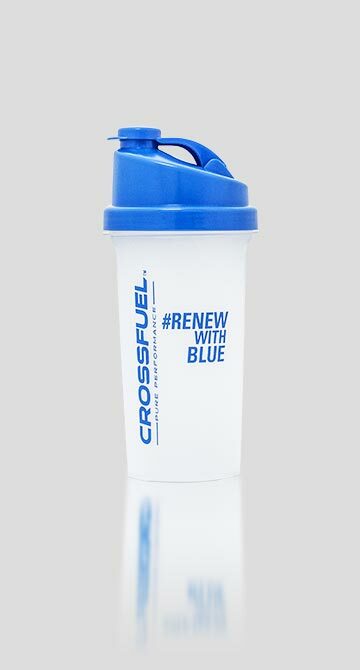 Use the Crossfuel Typhoon Shaker Bottle to mix all your CROSSFUEL drink and shake powders quickly and easily.